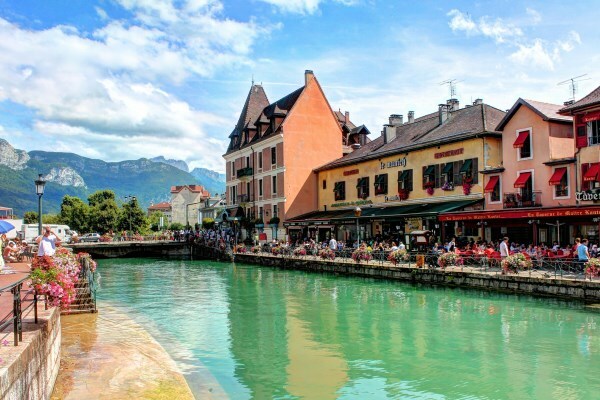 Annecy is a spa town divided between its lake and its canals. The Palais de l'Isle used to be a gaol and is built in the middle of the canal du Thiou. It is a symbol of the town and one of the most photographed monuments in France. You will appreciate the many pedestrian streets with arcades that run through Annecy and the fine walks on the waterfront. The finest of them is the rue Sainte-Claire and its 17th-century arches. The shores of the lake also offer enjoyable walks. In August, Annecy is clothed in light for the Fête du Lac, a fireworks and music show. Every year in June, Annecy hosts the International Animation Film Festival, which is known the world over. Annecy has several nicknames, as a testimony of its several facets. 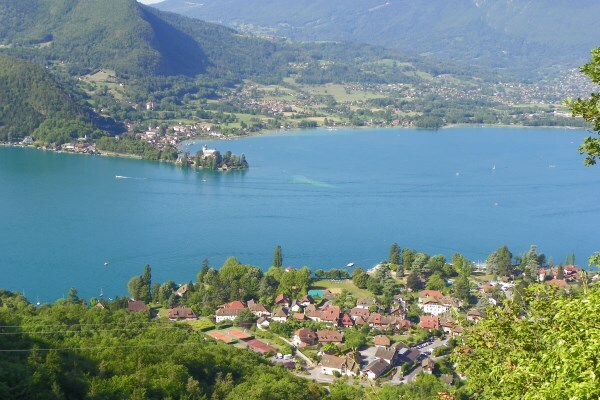 It is sometimes called the "Pearl of the French Alps" because of the beauty of its setting, which is a wonderful backdrop: on the Lake of Annecy, surrounded by the Bauges and the Bornes Mountains, the landscape that circles the city is absolutely splendid. 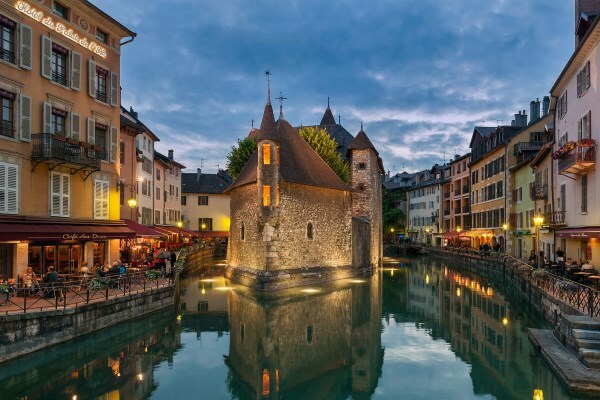 It is also called the "Venice of the Alps" because of the gorgeous canals that roam across the pleasant old medieval town of Annecy. Lastly, it is also called the "Rome of the Alps" because of its tumultuous religious history: Annecy used to be a major town in the Catholic Counter-Reformation, especially under the aegis of Saint-François de Sales. Annecy is a cultural city, which became famous mostly thanks to its International Animated Film Festival ("Festival International du Film d'Animation"). Every summer it also hosts the Lake Festival ("Fête du Lac"), a musical fireworks show that will delight both the tourists and the inhabitants. Last but not least, sport is in the spotlight, with Annecy Marathon which unfolds every year in April and gathers thousands of runners. There are several must-see and must-visit monuments in Annecy. Here are the most renowned: the castle of Annecy, the palais de l'Isle ("Isle Palace"), which you will find on many postcards. La Clusaz and the Grand Bornand ski stations are only one hour away. Annecy has a continental mountain climate, which means it is quite wet, all year long. Winters are cold and there are numerous snowfalls (however, they remain limited in the plains). Summers are mild, sometimes stormy. If you come during winter, don't forget the proper equipment: snow tires and chains, especially if you want to go to the ski station. Go on and visit the old city and the canals; they are gorgeous! If you come during summer, go on and enjoy a bath in the beautiful Annecy Lake: come on, the weather is not that cold! Both during summer and winter, you will be amazed by the beauty of the Bauges Mountains and the activities: skiing, sledging, snowboard during winter in average altitude ski stations, which are cheaper and quite nice-looking; during summer, hiking, tree climbing, summer toboggan, and camping. Avoid the lake's beaches in the middle of the afternoon. Wait a few more hours: there will be less people at the end of the afternoon and the water quality is still good. Moreover, some beaches become free after a certain hour. Low budget: 77€ per night in low season and 106€ in high season. Mid-range: 97€ per night in low season and 133€ in high season. Luxury: 170€ in low season and 196€ per night in high season. Les marquisats will give you direct access to the beach. The old city, where you will be at the heart of Annecy.